Jean Paul Riopelle, painter, sculptor and engraver (b at Montréal 7 Oct 1923, d at Île-aux-Grues, Qué Mar 12 2002). He trained under two completely different masters: the academic painter Henri Bisson, who considered even the Impressionists a bit too extreme, and Paul-Émile BORDUAS, who was totally immersed in the avant-garde and surrealist movements. 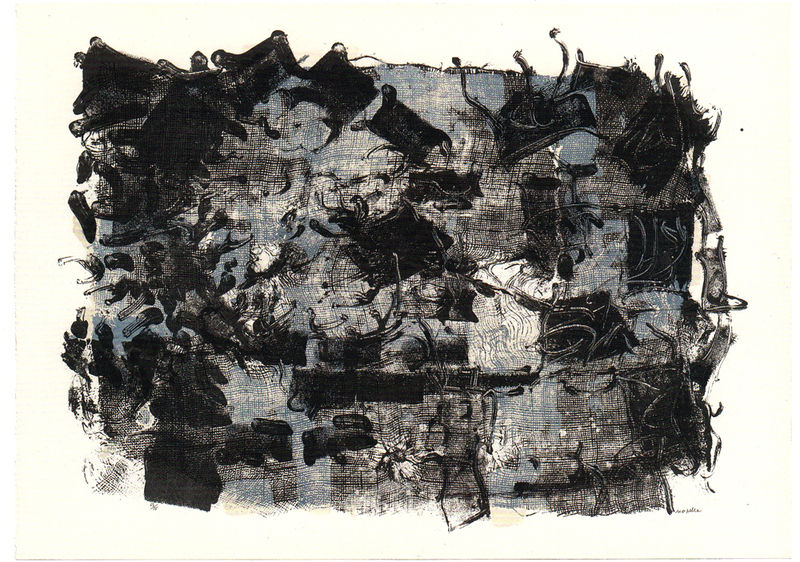 Borduas eventually won him over, and Riopelle joined the AUTOMATISTES school, exhibited with them in Montréal in 1946 and 1947, and in 1948 signed the REFUS GLOBAL (worldwide refusal) manifesto.However, Riopelle’s heart remained in Paris, where he finally settled. It was there that he found his vision, which he referred to as a controlled hazard. In Paris he was briefly associated with the surrealists and was the only Canadian to exhibit with them in 1947. In the end, however, he found that he had more of an affinity with what was known as the Lyrical Abstraction group. The 1950s were devoted to Paris (the critic Georges Duthuit took an interest in his work) and the Americas (the biennial exhibitions in São Paulo in 1951 and 1955, the Younger European Painters exhibition at the Guggenheim in 1953, the International Exhibitions in Pittsburgh in 1958 and 1961). This was also the period of his “grand mosaics,” paintings created using a spatula from multicoloured elements juxtaposed in a manner that recalls a landscape viewed from an airplane. During the 1960s Riopelle diversified his means of expression, turning also to ink on paper, watercolours, lithography, collage and oils. He also began taking more risks in his painting, as if he were seeking to undo his past successes in order to explore new avenues. His paintings became more chaotic and more matierist, with Riopelle demanding of his materials that they free him of form, his own form. The large painting Point de rencontre (Point of Intersection) (1963), which was intended for the Toronto airport but is now at the Opéra Bastille in Paris, is the masterpiece from this period. Beginning in 1969, Riopelle completed several sculptures, including the fountain in Montréal’s Olympic Stadium, which is called La joute (The Match) in honour of the hockey players who were his childhood sports heroes. In painting, he started the Hiboux (Owls) series, and at the same time developed an interest in Inuit string figures. In 1972, after the death of his mother, he returned to Québec and built a studio at Sainte-Marguerite-du-Lac-Masson in the Laurentians. A trip to the Great North introduced him to unfamiliar black and white landscapes, resulting in the Icebergs series. It is often said of Riopelle that he “returned to figures” in the 1980s, but it could also be said that he never really left them. 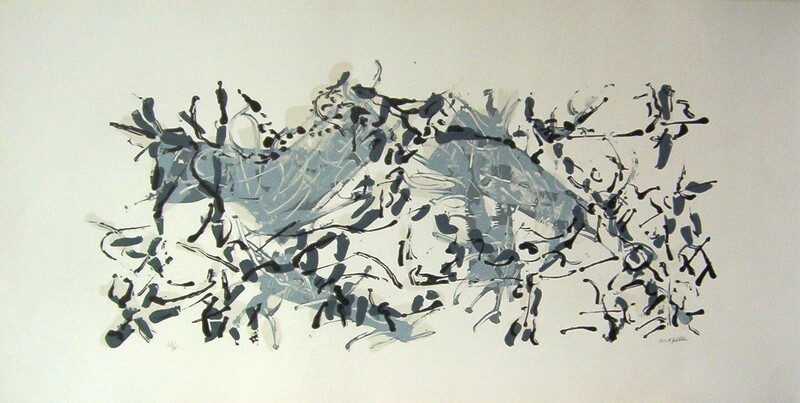 He started the Oies blanches series on white geese, great migrators like Riopelle himself. At the same time, he abandoned traditional painting methods in favour of aerosol spray cans and often created works of art that resembled photographic negatives; that is to say, he projected his colour of choice onto an object that he then withdrew in a way that left only a negative impression of form on the canvas. 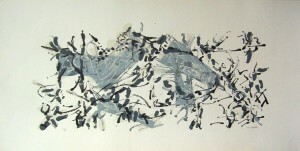 His Hommage à Rosa Luxemburg (1992), which now hangs in the Hull Casino, marks the high point of this period and is considered to be Riopelle’s artistic legacy. It is also a tribute to love, to the American painter Joan Mitchell who was his companion for 25 years. In 1981 he was the first signatory of the Refus Global manifesto to be awarded the prestigious Paul-Émile Borduas prize. Riopelle established his studios at Estérel, but he lived out his last years at Île-aux-Grues, upriver from Québec. This entry was posted in Biographies, Riopelle Jean-Paul and tagged eau-forte riopelle, etching, galerie clarence gagnon, galerie michel-ange, galerie valentin, jean-paul riopelle, lithographie originale, lithography, riopelle by chocolat. Bookmark the permalink.